The USS Tiger Shark is a submarine on patrol in the Atlantic Ocean in 1943. The submarine is ordered to pick up survivors spotted adrift by a British patrol plane. At the wreckage, they retrieve three lone survivors - a British nurse and two sailors, one wounded - of a British hospital ship that was torpedoed several days earlier. After that, the Tiger Shark must avoid a German warship attempting to find and destroy them. The submarine has several ecounters with the German warship and suffers heavy damage from depth charges in the process. The Commanding Officer of the Tiger Shark, Lieutenant Brice (Bruce Greenwood), discovers that the wounded sailor is actually a German POW, Luftwaffe pilot and family man Ben Archerlift, confronts him because he thinks the German has been causing strange noises to attract the German warship and believed it was an act of sabotage and then shoots him dead when the German panicked and grabbed for a scalpel to protect himself. Meanwhile, eerie events begin to manifest themselves and seem to be related to the recent death of the previous captain, Lieutenant Commander Winters. Winters had been killed after the Tiger Shark torpedoed and sank a German ship. Winters had ordered the sub to surface and had then gone topside with his senior officers to make sure the ship had sunk and to see if there were any survivors. According to LT Brice, Winters had wanted a souvenir from the wreck and had fallen and hit his head on the side of the sub while reaching for his souvenir, then fell into the ocean and drowned before he could be rescued. 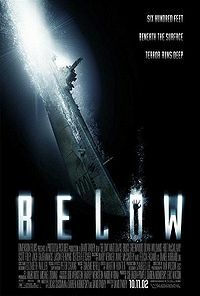 However, as the eerie events mount - strange voices are heard, a series of mechanical problems keeps the submarine turning back towards the site of the sunken German ship, and crewmen are killed at an alarming rate from various problems - the British nurse and sailor, and one of the junior officers on the Tiger Shark, begin to suspect that more is going on than just mechanical problems. They also begin to question LT Brice's version of how and why Captain Winters died. It is revealed that three senior officers, Brice, Loomis and Coors, were responsible for the death of Captain Winters. The British hospital ship was mistaken for a German ship and was sunk by the Tiger Shark. The three officers could not afford this blotch on their records and conspired to suppress the story, killing Captain Winters as he tried to save the wounded in the ocean to make up for his and his crew's drastic mistake. This is discovered after Coors is mysteriously killed while working on the exterior of the sub, and Loomis drowns after trying to escape the boat while submerged, in a craze after seeing Winters' ghost on board. After numerous accidents that completely cripple the boat, everyone on board is killed except for five: Brice, O'Dell, Claire, Stumbo, and eccentric crewman Weird Wally (Zach Galifianakis, in one of his early film performances). After the boat finally surfaces, Brice and Claire face each other down on the surface deck of the disabled submarine. Claire has spotted another ship in the area and tries to get its attention, but Brice holds her at gunpoint. His remorse over the accident overcomes him, and he shoots himself in the head, falling dead into the ocean. The four survivors are picked up by ship spotted by Claire, which turns out to be British. The final shot in the film is of the Tiger Shark sinking away from the surface, to rest next to the British hospital ship on the ocean floor.